The annual Bras for Cause campaign, Oregon Cancer Foundation’s most colorful fundraiser, will kick off in September, with the goal of raising $100,000 to support patients undergoing cancer treatment in Lane County. The concept is simple: We invite community members and local businesses to decorate a bra, then we showcase them online at brasforcause.org and in-store at Dandelions Flowers & Gifts in Eugene, and encourage the community to donate by voting for their favorites. Bras for Cause 2018 gets underway on Thursday, Sept. 13, with the first of two Build-a-Bra events. Bring your family, friends and co-workers, or come solo and enjoy an evening of fun. Bras and art supplies are provided – or bring your own, if you’d like! When: Thursday, Sept. 13, 4-7 p.m. When: Friday, Sept. 21, 4-7 p.m. Deadline to submit your bra creation to Oregon Cancer Foundation’s office or Dandelion’s Flowers and Gifts is Monday, Sept. 24, at 8 a.m.
Voting happens Oct. 1–31, online at brasforcause.org. Vote for your favorites; $1 = 1 vote, and you can vote as many times as you’d like. Bras for Cause wraps up with its annual Girls Night Out celebration. Grab your girlfriends and celebrate at this woman-inspired event. Enjoy dinner, music, a silent auction, games and a fashion show, featuring and celebrating local cancer survivors. When: Friday, Nov. 2, 6:00 p.m.
Tickets: $50. Click here to get your tickets now. When Viki Berry was diagnosed with non-Hodgkin lymphoma, a type of blood cancer, she was more than rattled by the news. “I kept thinking, how did I get cancer? What did I do that caused this to happen?” Viki recalls. It took Viki some time to wrap her head around her diagnosis. But once she came to terms with what she was facing, she chose to be an advocate for her health, both physically and emotionally. Viki sought treatment at Willamette Valley Cancer Institute, as well as support through a variety of resources, including Oregon Cancer Foundation. “I knew early on that I had to take care of me, and that’s not a selfish thing,” she says. Viki made physical activity a priority, finding time to exercise—from yoga to walking to step aerobics classes—even when she was fatigued from treatment or didn’t feel like moving. A cancer diagnosis brings with it a host of emotions, and many people, like Viki, would rather not burden their families with their worries and fears. Viki joined a blood cancer support group through the Leukemia & Lymphoma Society, which allowed her to connect with other survivors and to gather insight from their experiences. Viki also attends the NOURISH: Food for Life nutrition and cooking classes, a partnership between OCF, Positive Community Kitchen (PCK) and Whole Foods Market. The classes, taught by PCK president Shanna Hutton and held monthly, at no charge, offer cancer survivors nutrition information, as well as demonstrations on how to prepare meals that are gluten-free and feature seasonal ingredients. For more information on the NOURISH classes or to watch a cooking demonstration, click here. In addition to her on-going support group, Viki participated in Oregon Cancer Foundation’s Series on Survivorship, a 10-week series for cancer survivors that explores issues that often arise after treatment ends. Topics include how to manage anxiety, fears and other emotions; exploring forms of self-care and healing; understanding how relationships are impacted by cancer; and learning how to eat and exercise to be healthy and reduce the risk of recurrence. Planning for the next Survivorship Series is underway. There is no cost to attend. Survivors may participate on their own, or they can ask a spouse, partner or caregiver to attend with them. For more information and to pre-register, contact Amy Johnston at amy@oregoncancerfoundation.org or call 541.632.6354. For Viki, tapping into Oregon Cancer Foundation’s resources has been as valuable to her as the medical treatment she’s received. And she regularly shares with other survivors information about services available in the community. When the Eugene Pro Rodeo rolls around each July, Jaymie Woods sees pink. Jaymie and her family don pink one night of the rodeo each year for Tough Enough to Wear Pink Night, to raise awareness about breast cancer and to support survivors through Oregon Cancer Foundation’s Financial Assistance Program. Jaymie’s mom, Karla Defoe, had a passion for people and horses. Alongside her husband, Major Defoe, she was a driving force in resurrecting the Eugene Pro Rodeo, which is now entering its 27th year and draws competitors and spectators from around the United States. Tough Enough to Wear Pink Night, and the rodeo itself, is truly a family affair. Jaymie’s father, Major Defoe, her brother and sister, as well as their spouses and children all play a role in organizing, operating and participating in the event each year. After her mother’s passing, Jaymie and her family wanted to find a way to honor Karla and to help support breast cancer survivors in the community, so Jaymie reached out to OCF Executive Director Amy Johnston. During the Eugene Pro Rodeo’s Tough Enough to Wear Pink Night, cowboys, staff and spectators proudly wear pink clothing in a show of solidarity for breast cancer awareness. Attendance at the event has grown over the years, creating an impressive display of pink throughout the arena at the Oregon Horse Center. Jaymie and her family are focused on making the rodeo a family-friendly event, and bringing back the nostalgia that Jaymie remembers so well. Gates open at 5:30 p.m., Grand Entry begins at 7:30 p.m. Wear your pink attire or purchase some at the event. Participate in the Pink Frisbee Toss for your chance to win prizes, including a $1,000 gift card from Jerry’s Home Improvement Center. All proceeds benefit Oregon Cancer Foundation. Tough Enough to Wear Pink Night at the Eugene Pro Rodeo is held in honor of Jaymie Woods’ mom, Karla Defoe. Cowboys to spectators wear pink to spread breast cancer awareness. There are pink activities and games to raise money for OCF. 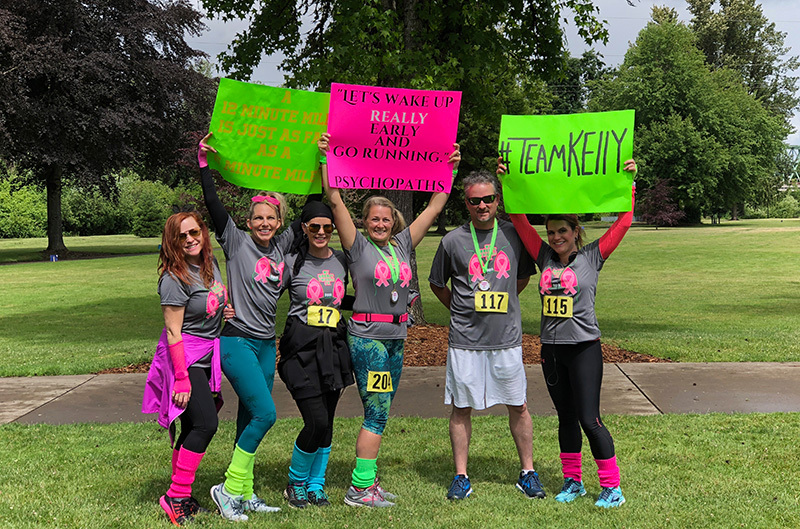 When breast cancer survivor Kelly Barton thought about how she wanted to celebrate the end of chemotherapy, her friends suggested she plan a 5K. After all, Kelly is no stranger to organized running and walking events. This marathon runner has been participating in races since training for her first event seven years ago. The My Breast Friends 5K event came together quickly with help from friends and family and incredible support from Kelly’s employer, Timber Products Company, and other sponsors including Armadillo Roofing, Jones & Roth, Oregon Imaging Centers, Umpqua Dairy Products, Habitat Contracting, LLC, North Fork Roofing Materials, Inc, and Northwest Surgical Specialists. Kelly’s goal was to have 200 people participate and to raise $10,000 for OCF. She was amazed when registration for the event, which was held earlier this month, topped nearly 300 people and generated almost $13,000! The Oregon Cancer Foundation is incredibly grateful when people and organizations in the community offer to host a fundraiser to support OCF’s mission. The money raised allows the foundation to help more patients through OCF’s Financial Assistance Program and educational events, including the foundation’s Survivorship Series. Kelly has decided to make the My Breast Friends 5K an annual event. To see additional photos from this year’s race and to get information on upcoming events, check out the event’s Facebook page. Kelly Barton, along with her husband and daughter, prepares to lead off the race. Even though it was raining, no one seemed to mind! Kelly’s biggest cheerleader – her mom! The recipients of the 2018 Swallows of Hope Awards were recently announced at the Oregon Cancer Foundation’s annual Neighbors Helping Neighbors Breakfast at Valley River Inn, in Eugene. The awards honor one community member and one health care provider who consistently go above and beyond to spread hope to local cancer patients. While all of this year’s finalists, nominated by the public, are truly worthy of recognition, the following individuals received awards for their dedicated efforts in supporting cancer survivors in our community. When florist Shirley Lyons of Eugene and her daughter Toviana Jackson started Bras for Cause in 2012 to support Oregon Cancer Foundation’s Financial Assistance Program, they never imagined what it would become. “We’re in the emotion business, and we help people celebrate their most exciting moments in life and some of the most difficult and challenging,” Shirley says. With Shirley’s involvement and enthusiasm, Bras for Cause has grown over the last seven years, from raising a couple thousand dollars in 2012, to bringing in over $82,000 in 2017 with the addition of Girls Night Out, a celebration event that serves as the campaign’s finale. For Shirley, the community involvement and stories that are shared by participants during Bras for Cause are just as important as the money raised. Plans are underway for the 2018 Bras for Cause campaign this fall. Stay tuned for details. Click here to watch a video featuring this year’s award finalists in the community category. Humbled to receive the award, but not one to seek recognition, Dr. Gonenne credits his stellar team at Eugene Gastroenterology Consultants, as well as our highly skilled medical community, for the level of patient care he’s able to deliver. As a member of Oregon Cancer Alliance’s gastrointestinal team, Dr. Gonenne works alongside other multidisciplinary specialists in the community to collaborate on challenging cases and identify the best course of treatment for each patient. “Over time, this team-approach has evolved into a tumor board that has been meeting twice a month for 10 years on behalf of patients. It’s really made a difference in patient care, and I’ve been honored to be involved in that,” says Dr. Gonenne. Dr. Gonenne’s colleagues say his dedication to his patients is unwavering, from his participation in community events to raise awareness about colon cancer screening, to his constant efforts to make sure patients are seen in a timely manner, no matter what. Click here to watch a video featuring Dr. Gonenne and this year’s award finalists in the health care category.